Weekly fishing Report– Osprey Chick is a Bonus at Lochter! Fishing is a quiet relaxing pursuit, which provides opportunity to see and hear nature close up. It is one of the great joys at this time of year to see the broods of ducks, moorhens, swans, geese and other water fowl being carefully guided through their early days by attentive parents. Lochter Fishery is a haven for wildlife and our customers get particular pleasure from watching our resident pair of ospreys – Branson and Libby – fishing and carrying trout to their hungry and demanding chick. The fishery had installed a hi-tech camera, which streams a live feed of the nest to two large TV screens in the restaurant, and this is very popular with the diners. While the osprey uses its amazing sight and razor sharp claws to catch a wary trout anglers during the week had to ring the changes to keep the fish coming to the net. Bright humid conditions and a plentiful supply of natural insect life made it interesting for anglers and gave them a chance to vary their tactics accordingly. Steve Price on an intermediate line and using Hares ears, diawl bachs and buzzers landed 24 fish during his full day session. Paul Ingram used a sink tip to his floating line and enticed 18 fish to small dennis the menace buzzers and a gold head hares ear. Karen Fraser had an exceptional day where she caught 11 fish with two of them over 10 lb and one over 8 lb all caught on buzzers and the kennick killer. Those of you who like to keep updates on the Blobby Boys – Doug and Billy – they came out for a session in the blazing sun of Saturday but they did not disappoint and took 41 fish between them, fishing deep on buzzers and diawl bachs. Greg Watt landed 14 fish but said in the return book that he lost more than 20 fish and one of his landed fish was over 8lb. What was noticeable was when the cloud cover came in then the fish immediately switched to surface feeding and Kenny Wilson from Aberdeen had 14 fish on small back dry flies size 16 or smaller. K Lynch used a size 18 CDC to good effect netting 18 fish, Albert Trail had 11 fish all on daddy’s and R Will had what he called a ‘cracking day’ with 10 fish on floating hoppers. Jason Stewart and Stuart Daniel didn’t need to use any ‘dark arts’ when they fished together and both caught 9 fish on olive damsels and WSW as they recorded they had a ‘pure dead magic’ day. As the summer continues anglers will have to continue to vary their fly choice and of course the evening rise has been exceptional some evenings so it might well be worth a cast then also. 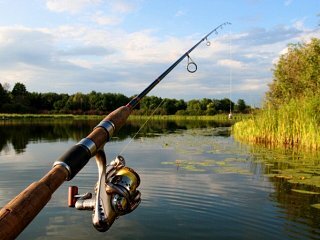 Fishing is a quiet relaxing pursuit, which provides opportunity to see and hear nature close up.